Ensemble improvisation is one of my favourite activities to do at group workshops. In this episode, I’ll teach you how to do this with the 12 bar blues, no matter what instruments you have available! Vibrant vibrant vibrant music teaching proven and practical tips strategies than ideas for music teachers. This is episode thirty eight of the vibrant music teaching podcast. 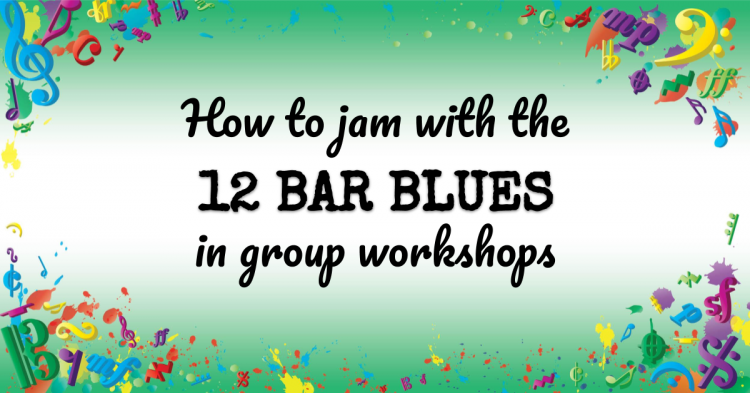 I’m Nicola Cantan and in this show I’ll teach you how to have fun with the 12 bar blues in your group workshop. Hey there beautiful teachers. Okay first of all on this group workshop thing. Let’s just clarify what I mean by that. Because you might confuse it with what I would call a group class. When I say group workshop I’m always referring to something that doesn’t happen regularly or isn’t a student’s main form of music education. Right. So if you’re doing group as your way to teach piano or another instrument every week that’s not what I would call a group workshop. Although you’re welcome to try these ideas in more regular group classes as well. It could be really really fun to do. But when I talk about a group workshop I’m talking about something that happens occasionally or semi regularly. So for example in my studio I do four group workshops a year many teachers will also do them once a week or once a month and they could be instead of lessons for a week or they could be as well as them so minor as well as my other lessons I do them in addition on the weekends after students have had regular lessons all week. But many teachers do them instead of regular lessons for one weekend of the month. They’re out of the term or out at the year so that’s just a little bit about what I mean by group workshops. But I am going to talk about structuring them and whether they’re right for your studio and how to fit them in. Next week on the show this week I just want to share this activity with you mostly and talk about what we actually do at these workshops. So to give you a quick rundown of some of the activities that I do at my group workshops I do improvisation. We play games of course because I love playing games with my students. And anytime a group of students is together we’re going to be playing games. We talk about practice strategies and try them out together. We do a concert rehearsal practice before we have a concert or recital coming up then we’ll do practice test runs of our pieces. We do lots of rhythm activities like the ones in my book rhythm and five and many others. We sing together I love the Kodály songs for this singing games. The book I have is from Nikon the National Youth Choir of Scotland and it has a whole collection or rather I have three of these books but they have whole collections of singing games and rhymes that you can do and some of them work great for my group workshops. I will say that actually for a few of them you would need a lot more students than I would have right there designed for classes and I would only ever have say eight or 10 max at a time because otherwise it’s just me against them and we’re in a private teaching studio it’s not going to work with more than that. So I do have to adapt some of them and be a bit careful about which ones I choose. 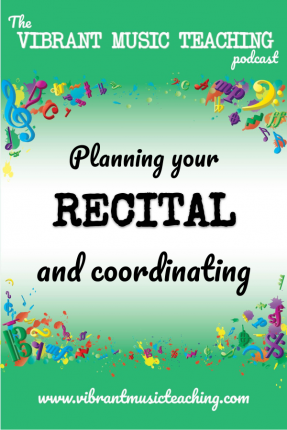 But those are great for doing a group workshops and we also listen to music together and have discussions around that do different listening exercises based on pieces that students are gonna be working on or have particular themes that are relevant to what we’re doing at that group. But what I want to talk about today specifically is that first one the improvisation section. So we do various different forms of this improv and all will follow a similar format to the 12 bar blues version that I’m going to be talking you through in this podcast. We improvise using classical themes so we’re studying a particular composer. I’ll take the chord progression or something identifiable from one of their most famous works and turned it into an improv and there’ll be more on this in my workshop plan and video walkthrough. That will be coming out on vibrate music teaching very soon. So VMT members will be able to find that pretty shortly. Classical themes are just one option though we also do a lot of work with folk songs creating our own variations or improvisation activities based off of folk songs or Christmas songs I’ll include that in this category as well. And then the last one would be the twelve bar blues or a pattern like that. So let’s take a look at the twelve bar blues and how we would do it as a bit of a case study of this whole ensemble improvisation activity that we do at all our group workshops. We have several instruments on the go and I’ll use a mix of these depending on the students that are there and sort of what I feel like on the day right. But all the things I have available are a piano a digital piano a keyboard which really is a keyboard. Okay. It’s not weighted. It’s touch sensitive which is something that is 61 keys so it’s very much a keyboard and I only set it up for these group workshops as the only time we really use it. I have a glockenspiel not a particularly fancy one but it works for these situations lots of different untutored percussion instruments boom whackers which if you’re not familiar with those those are big plastic tubes that make very low notes and they’re certain lengths depending on what note they are and they’re all different colors of the rainbow based on the chroma colors. So the boom whackers company calls this Chroma notes or Chroma colors or something but it’s where C is red and says Do on it so you can use it with fixed solfege as well. And there’s a whole set there I have the chromatic set so I have all the sharps and or flats that we could need as well. And then I also have bells which are matching colors to those boomwhackers their little desk bells. So those are I think if you just search for Chroma note desk bells I’ll put a link in the show notes to these things I’m mentioning. But if you just search for Chrome a color or chrome and note desk bells and I think they’ll pop up. Ok so those are the instruments I have available. Piano digital piano keyboard glockenspiel untutored percussion of various types boomwhackers and desk bells. Now I’ll generally only use the bells or the glockenspiel because I kind of do the same job. And from there I’ll just be selecting the right number of instruments for the number of students I have. So if I’m gonna use the boomwhackers that’s already three students or perhaps two. But if we’re doing the 12 bar blues right there’s three different chords and I’ll have the boomwhackers do the bass note of those chords. So that means we need a C and F and G and asking one student to switch between them is possible for sure but for most students that’s gonna be a little bit too much especially since my students tend to be on the younger side right. So let’s say for an example that I have 10 students at this workshop just to keep it nice and clear. So I have three students on boomwhackers. If I have 10 students one is going to be on either the glockenspiel or the bells and they’re also going to play the root note of each chord as we go through the twelfth blues. So one student is there it’s easy to handle three desk bells that’s not a problem since you’re pressing on the top or a glockenspiel obviously you can play the notes and if we’re using the glockenspiel I’ll normally put little tabs on the C F and G just to help out my youngest students so that they don’t need me sitting beside them and holding their hand and not literally but walking them through exactly where each of those are if they can’t see that pattern instantly right if they’re on a four or five years old. So I’ll put little stigmatize make it super easy for everyone and often I’ll color coordinate those with the boom like colors which I’ll also do on the sheet that we’re looking at to play the pattern. So we have the twelve hour blues laid out. I’ll write that in C now just a quick note there often if I’m doing the 12 hour blues with one student I’d start in a flat because the flat blues scale is easier to find and play. But for a group workshop since most of the students are playing the chord notes I’m gonna use the C because it’s easier for those core tones. Right. So one student is on the bells another two or three are on the boomwhackers. So we’ve got six students left to play with. So I would put one student on the percussion in that case I got six students left and then I would have one on the keyboard two on the digital piano and two on the piano. So let me talk through each of those stations. The keyboard. We’re going to change of sound of to one of the instrument options and they’re going to do the chords or root notes of the chords depending on their level. Right? So if you have a further ahead student I would have them do you know make up their own rhythm pattern using chords and octaves in the left hand. But if you’ve just a brand new beginner they’re just gonna play C for four beats at a time hold them down so you do three two three four, three two three four and then switch to F and then G when it comes up following the pattern. So each student at each station has the twelve bar blues pattern directly in front of them. And for this I would be using the one that I have in the blues he sends cards which is inside the five music teaching library. It’s just a simple layout of a 12 hour blues you can substitute that with any 12 bar blues illustration that you have. Right you just want to have it clearly laid out so everyone knows where we are and what the pattern is and doesn’t have to remember it. So my student at the keyboard has which our instrument to whatever tuba or something and they’re playing the chords or they’re playing single notes the two kids at the digital piano my digital piano can split in half. Most can and have two different instruments on two different halves. So we’ve got two more instruments there how we might have the strings or something bizarre and maybe the glockenspiel if we don’t have the Glockenspeil is real over there could be anything and then they are doing the same thing still just playing chords or root notes so almost everyone is doing that one job right to really get that the chord changes in there then we have the piano the person at the second side at the lower side of the piano is going to also play chords or root notes or octaves and patterns whatever they have and then the person at the primo side is the improviser they’re the only one playing the blues scale. And again to make it easy on my youngest students I’ll have sticky tabs on the keys to lay out the C minor blues scale so that they can easily see the pattern play the notes and not play the ones are not supposed to play. And from there my percussion student my student who’s playing the untutored percussion in a drum more maracas or whatever they have chosen I let them pick themselves they are going to count us in there that’s their job and they’re going to keep this steady beat. So when we’re just starting out with this I’ll have everyone all the students playing the chords just holding them for a semi brief four beats whole notes and for each bar and the Russian person is going to sound it each of the beats to keep us on track and the improviser can do whatever they want with this blues. So the percussion the drummer who whatever they’re playing they’re going to can in and they one to read a play while they do it and then they’re going to keep that going and they’ve to keep the beat really steady throughout everyone’s job is to listen listen so that we can stay together. Everyone is holding their notes so the boom workers are playing the first beat of every bar for example as are the bells and then everyone else is holding down their note on the keyboards and pianos. Once we’ve done a round of that and it’s been reasonably successful in this configuration we just rotate everyone moves on one spot and we start the pattern again. You can do this with or without a repeat. I like to do with a repeat because it just gives a little bit more time to think and it helps us work on doing the five as the turnaround instead of the one at the end. So I actually have this written out as being a first time buyer and a second time bar or first ending second ending so that it’s really clear for students if they can follow that pattern. We rotate around. We tried in the Nuclear Regulation we rotate we rotate we rotate. So this is a really fun way to work on the 12 bar blues and mostly to work on just playing with other people staying in time with other people. It’s not that easy as a skill. And we talked about this in the episode I did about playing duets and creating duet skills but it’s something that takes practice to be able to play in times day in time with other players listen to the overall sound as well as doing your part correctly and as kids move through the stations they might gain confidence and then want to do the chords instead of doing just the root notes or something like that so develops over time. And I’ll let the kids at the digital piano or the keyboard sometimes change the instruments themselves so that they get to choose how it sounds. And we discussed which one sound better did we like the sax and the keyboard or did we like the bass player what did we like. So I hope that explanation was reasonably clear it’s not the easiest thing to explain over audio but I wanted to give you this idea so that you can take it and run with it in your studio and see that it’s it’s really pretty easy and can be really fun when you get your students together in a group workshop to do some improv together it doesn’t have to be this scary activity or require a ton of training or anything like that you can take something this simple keep their parameters super basic they’re just playing root notes or just playing chords and only one person is improvising and that’s it everyone is sticking to the same rhythm everyone is just focusing on playing together. I hope you’ll try it out in your studio. We have a lot of fun with this exercise and as I say I do this with not just the blues but classical themes or folk songs or anything else where we take the chord progression or bits of the melody and we improvise on top of that and use it to create big ensemble. If you don’t have keyboards at your studio you can do this just with the percussion. It’s really and if you don’t have percussion instrument grabs them they’re really not expensive you can get a whole set of educational percussion instruments for not that much and you’ll find you’ll use them for so much it’s really a fun way to spice up your students pieces that they’re playing and private lessons as well and get them to do rhythm work rather than just clapping all the time getting them to play some drums instead is so much more rewarding. So no matter what instruments you have available you can do some version of this exercise and I hope I’ve given you some food for thought in terms of how you configure it in your studio based on what I have available I’m really just using anything that I have and finding a way to make it fit together as a group ensemble improvisation. Next week on the show I’m going to be talking about five different ways that you can fit group workshops into your studio. So if you love the idea of doing this improv but you don’t have any group workshops to do it in then next week is the episode for you because I’ll talk you through how you could bring group workshops into your video and what the benefits could be. You can find the show notes for today’s episode at vibrantmusicteaching.com/38. That’s just the numbers 3 8. And before I let you go I just wanted to let you know that I have a new game up on the blog and in the vibrant music site for Easter/spring. And piano power booster 2 lesson plans. These full courses with videos to walk you through each and every lesson along the way will help you to create a framework to teach aural rhythm theory and technique. For the first two years of lessons or even three years if your starting student as a preschooler in the tiny finger take up. Check it out inside the video library right now if you’re a member and if you’re not a member you can sign up at VMT.ninja. The above audio transcript of “VMT 038 – How to jam with the 12 bar blues in group workshops.mp3” was transcribed by the best audio transcription service called Sonix. If you have to convert audio to text in 2019, then you should try Sonix. Transcribing audio files is painful. Sonix makes it fast, easy, and affordable. I love using Sonix to transcribe my audio files.